Lenny and Monica loved almost everything about their house, originally built 60-70 years ago. One space they were less than enthusiastic about, however, was the outdated kitchen. Of its many peculiar features, the most challenging obstruction was the intrusive backside of the chimney. It was smack in the middle of a major wall, and made the narrow kitchen space a nightmare to navigate. Beyond physical limitations, the décor was also in desperate need of a modern craftsman’s touch… Read More. For a few months, Carolyn had been considering an update on her kitchen. She enjoyed entertaining and realized that her kitchen was not exactly up to the standards she wanted to present. She received a post card from ReBath Northeast announcing that they had opened a kitchen remodeling department with a full showroom. Since she was happy with the job ReBath Northeast had done with her bathroom, she decided to visit their kitchen showroom. She met with designer Pat Costantino and with the owner Rich Rome. She spoke with Pat about the island she had in mind, as well as the colors she wanted to see. Pat created a design for her and showed her some cabinet and countertop samples. After thinking it over, she realized she had some reservations about working with a team new to the local kitchen remodeling scene. Rich spoke with her and set her mind at ease. A week later, Carolyn signed the contract and her materials were ordered. When the installers arrived at 7 a.m. on a Monday in October, Carolyn was thrilled to see that they got right to work. They removed all of her old flooring, cabinets and countertops. By the time she got home from work that afternoon, the crew had already installed the new floor and was beginning the lower cabinets. Her reservations about the remodel were completely washed away. The next day Rich stopped by the job to see how things were progressing. He was happy with the progress but something was bothering him. In Carolyn’s kitchen there was a divider wall that had spindles coming down from the ceiling and attaching to a ¾ height wall. She had said she wasn’t planning to take the spindles down, but Rich knew her vision for a gorgeous kitchen would not be complete otherwise. He discussed this with her and also suggested adding two pendent lights over the island. She agreed that both things would complete the remodel. As the week progressed, she got more and more excited to see the finished product. As promised, her kitchen was finished by Friday afternoon, with just a few small things for Bruce to return for on Saturday morning. Carolyn loved the openness of her new kitchen with divider wall gone. Rich was absolutely right about the design. 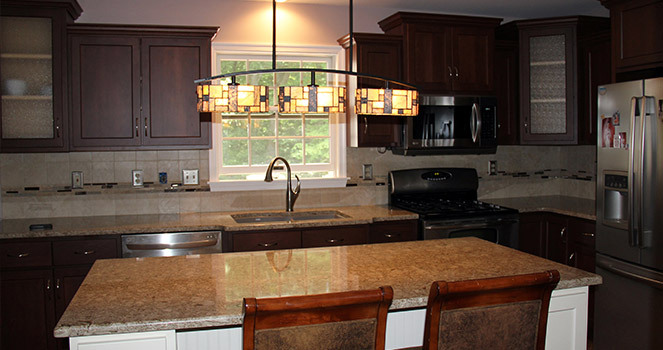 She also loved the new pendant lights over the island, because they truly completed the kitchen. Since her kitchen remodel, Carolyn has been happy to tell all her friends about One Week Kitchens® and is on her way to earning some referral money. Marie and James absolutely love the bathroom remodel that ReBath Northeast did in 2013. Bruce and Judd paid such great attention to detail during the install and even cleaned up perfectly. When Marie and James heard that ReBath Northeast was opening a sister company to remodel kitchens, they were one of the first people to visit the new showroom. 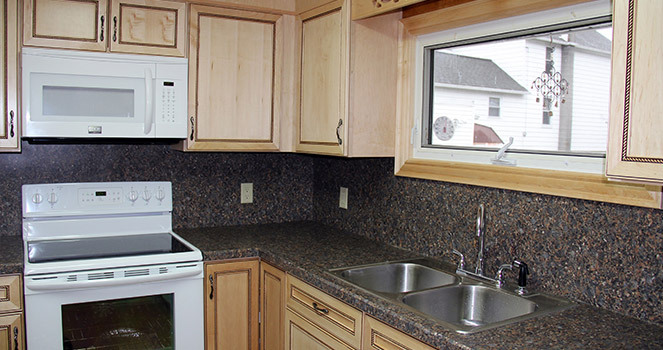 At first, they just wanted new laminate countertops and a backsplash installed. 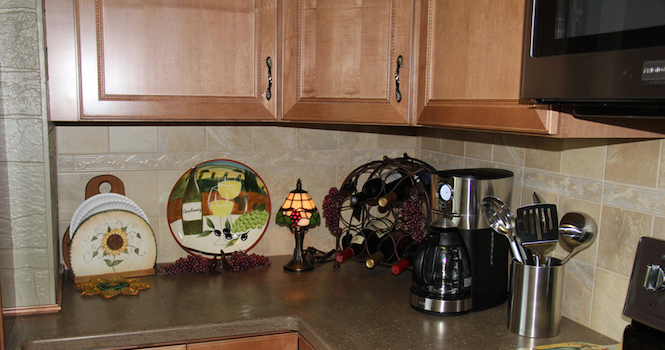 Our designer Pat visited their home in Pittston and took a look at the cabinets. While they were in decent shape, Pat just couldn’t imagine having old cabinets when nearly every other room in the house had been remodeled. He gave them the price for the cabinets with the countertops and the price for just countertops, and let them decide. When Pat and Rich met the couple in the showroom a few days later, they explained the benefits of each. 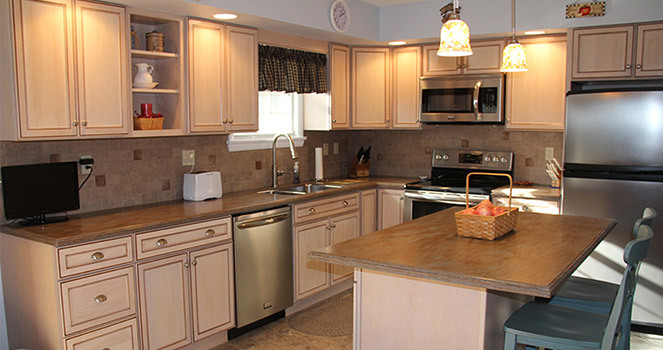 Marie and James decided new cabinets and countertops were worth the money and began choosing colors and styles. About a month later, Bruce and Judd once again arrived at their home. They removed all of the old cabinets and countertops and immediately set to work. The week went relatively smoothly, with Pat dropping in to check on progress. The kitchen was mostly finished on Thursday, with just a few finishing touches to be done on Friday morning. Marie couldn’t believe how fast and efficient the guys worked. It took just a week to transform her whole bathroom and just a week to transform her kitchen. Marie and James are extremely happy with the work that was done in their kitchen (and bathroom) by our crew. They are our biggest fans, often referring customers to us and commenting on our social media pages. We are very thankful for all the business they have given us and continue to give us. When Terry and Jeff visited the Northeast PA Home and Garden show they weren’t looking for anything in particular. They were considering remodeling their kitchen but were in no rush. They stopped by the One Week Kitchens® display and spoke with a woman about the company. The display was impressive and they liked what the woman told them so they decided to set up an appointment. When Pat arrived at their home, he saw a kitchen that, honestly, wasn’t very impressive. The builder grade oak cabinets were quite outdated and the laminate countertops just didn’t fit in a home so nice. Pat spoke with Terry and Jeff about their needs and wants for the layout. He suggested that they make the island bigger, stagger the upper cabinets and make the island a different color to accent it. The couple loved his ideas. 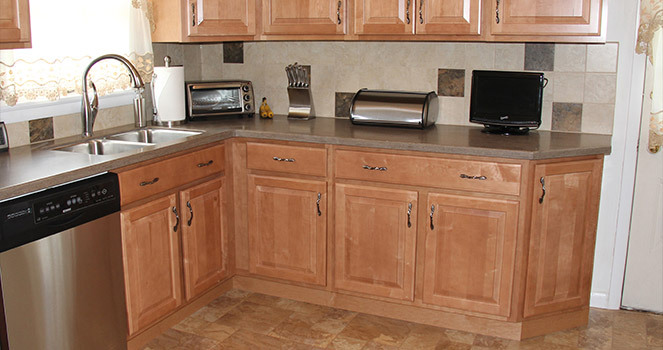 After much consideration, they were happy to choose One Week Kitchens® to do the job. By the end of July, all of the materials had arrived and the crew was ready to start work. Bruce and Ken removed all of the old materials and began setting the lower cabinets. The couple had chosen a much darker cabinet than what they had. Though very pretty, the beech cabinets with the Café finish made the kitchen very dark. Once the cabinets were in, Terry and Jeff decided they would need to add under cabinet lighting to give the room some more light. Since the home was relatively new, the remodel went very smoothly. Bruce and Ken installed all the cabinets and trim over three days. The countertop crew came and installed their new Cambria tops and John, the tile guy followed him. Over the course of seven work days, the crews completed the job. Once the kitchen was finished, Bruce went back to the home and installed the new lighting. Terry and Jeff love their new kitchen. Making the island bigger was a fabulous idea and made seating much more comfortable. The couple’s beautiful new kitchen now matches their lovely home perfectly. Joe and Kathy had wanted to have their kitchen remodeled for 15 years. They had gotten estimates, chosen materials and then put on the brakes. Just like any couple, they were worried about spending money on a large project – but that wasn’t their main concern. Joe and Kathy have a son with special needs. Since their son, John, has a form of Autism, they have to be concerned about changes to his environment. The noise of someone working on the kitchen for weeks could really upset him. Since Joe and Kathy had ReBath Northeast remodel their bathroom, they received a flyer when their sister company One Week Kitchens® opened. Knowing that the ReBath crew did not upset their son during the bathroom remodel, they decided to give One Week Kitchens® a call and see if they operated in the same way. When Pat arrived at their home to discuss design, Joe and Kathy quickly connected with him. He reworked the kitchen layout so that it would make more sense for their family and he helped them choose colors. He then invited them to the showroom to see all the samples and talk about price. Kathy will be the first to admit, she was very hesitant to make such a large investment. After speaking with both Pat and Rich, the owner, at the showroom, she felt much more at ease. They listened and never pressured her to make a decision. They met with Pat again and signed the agreement. When Bruce and Ken arrived a few weeks later, ready to start, Kathy wasn’t sure what to expect. She watched them work for a little while and chatted with them. By the time they arrive the next day, she felt like she knew them her whole life. Her worries about John’s reaction to noise and strangers in the house were completely gone. She noted that the only time Ken or Bruce stopped working was to show John what they were doing and chat with him. She was touched by the kindness they showed her son. By the end of the week, the remodel was finished and Kathy was honestly sad to say goodbye to the crew. She was so impressed with their professionalism, cleanliness and their kindness to her son. In a letter Kathy wrote to us, she told us how critical the quick time line was. She didn’t think her family could have survived a contractor in and out of their home for a month. She added that having workers with such integrity and kindness was a huge bonus that they will never forget.